relax and leave the rest to us.. Sunny Garden apart-Hotel is located 50 meters from Gliatis beach Ancient Epidavros in a greenery rich area with orange trees and flowers. The independent, newly-built, comfortable apartments and studios have air-conditioning, TV, telephone, Wi-Fi and a fully equipped mini kitchen. The studios are located on the first floor and each one has its own private garden. 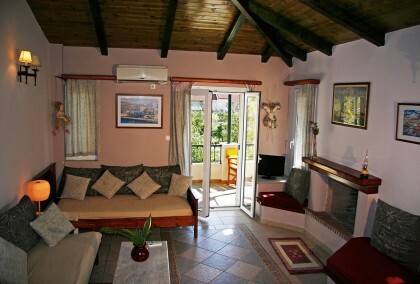 The apartments are on the upper floor with spacious balconies and a great view to the sea of Saronikos gulf. At the hotel’s garden there is a snack bar where you can enjoy your breakfast or the drinks of your preference. Our aim was the creation of a small unit, capable to provide impeccable services in order to satisfy the taste of a demanding market of holiday makers and to create such a hospitable atmosphere that our guests would feel like finding a new home away from their own. Apartments are located on the secong floor. Each consists of two rooms and a balcony. 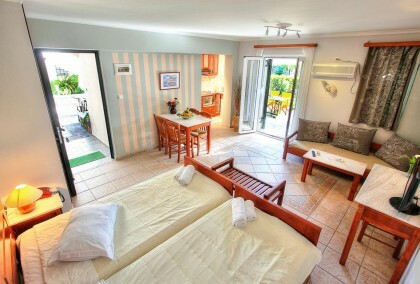 The hotel/apartments is located in a beautiful garden amidst orange trees. The room we stayed in was clean and well equipped, free internet. The people are very friendly and helpful. Breakfast is fantastic with fresh orange juice from the garden, home made pastries and marmalade etc etc. The sunken city beach is within two minutes walk from the hotel. On the beach you can have lunch at a very nice tavern. They also have beach beds. You can walk to the village in 15 minutes.